Anil Kumble also known as Jumbo to millions of Indian cricket fans all over the world finally decides to retire after a successful international career spanning 18 years and >950 international wickets and again , praises have been sung, dedications have been made and the whole world went ga-ga over him but just for two or at the max three days and then everything is back to business, no tears being shed, no poetic eloquence to grieve his departure which is so typically Kumble, always the one to stay away from media glare and glamour, even his departure was the same, quite and subdued. The news of the retirement just came in a flash, we were all struck by the magnitude, discussed about the news, got nostalgic but now everyone is back to business. Kumble was never the star of the team, not one who couldn’t be dispensed with, there was always a substitute ready for Kumble, one who was “really” a spinner, unlike Sachin, Dravid and Ganguly, though at this juncture most people would agree with the fact that he is the most important character of Indian cricket of 90s and 2000s after Sachin. You couldn’t find a more potent bowler than this tall guy on Indian pitches where he won many a matches just by the might of his non-spinning spin bowling. Every time the openers of opposing team stormed off to a rollicking start in a one day game thanks to not so special pace attack of India all through the 90s, you would see this man bouncing the ball in his hands and coming on as early as even the 6th over at times and rarely did he disappoint you, even if the wickets were a hard thing to come by, atleast the run flow was controlled so that normal services could be retained. For some reason I have always been a sort of admirer of the man, even when Kumble bashing was the in thing is Indian cricket circle, Almost all through my life I have generally given him the second billing after Sachin (ofcourse). There is an incident which repeatedly comes to my mind these days with the news of his retirement. I don’t exactly remember which season it was but it must be quite a few years back, Kumble was having quite an ordinary season and not getting as many wickets as expected or required from him. I was quite young then but I remember my dad kept saying at times that Kumble must be dropped from the squad and to this day I remember that as the first instance when my opinion differed from my dad’s and I made it clear to him always supporting him and backing him with a silent prayer for him, so that I could prove my point to my father, and now at the helm of Indian bowling, 3rd highest wicket taker in Test Cricket, he has proved me right. 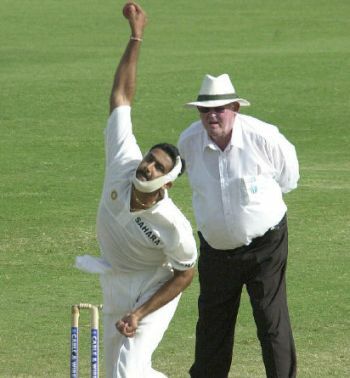 Kumble has certainly given Indian fans the most proud moment in the history of Indian Test cricket by being the bowler to take 10 wickets, Indians may trounce players from other nations when it comes to records concerning durability whether it be most wickets in a career, most centuries, most runs, Indians have had it all but there are very rare innings the performances in which are considered to be the best in the world (specially in tests), with only the Laxman’s 281 being the only one recognized. The nostalgia is overwhelming, we all will miss the angry stare at the fielder for misfielding a ball, the ct Dravid b Kumble entry in the scorecard and most of all we will miss incidents like Antigua and Delhi, when he comes back to claim a Lara while bowling with a broken jaw or when he cleans up the Australian tail with 3 fingers of left hand bandaged together and with 11 stitches in the hand. With him departing it is now only Sachin who remains of the first Indian team I saw playing, the team of 96 World Cup. It almost feels as if not only they are getting older but we are also having a transition where we can be regarded as the previous generation by the kids high on the cricket of the Dhonis, the Yuvrajs and the Ishants!! With this generation of players going out, we will also see the noble Indian cricketers going and replaced by the Harbhajans and Sreeshanths, ready to slap on slightest proclamation. Of all the 12 years of watching cricket, I can only remember one incident when Kumble was disturbed with the opposing batsman, the sole incident coming against Eddo Brandis of Zimbabwe and even that frustration was shown only after dismissing with a few words spoken in front of his team mates, no pointing to the pavilion and absolutely no circling the batsman to express his fury. Perhaps one of the most fitting tribute for him came when Laxman said “you should look at him, even with a broken left hand he took the catch and we were dropping sitters” goes on to say a lot about Jumbo!! Good to see someone write a tribute for Jumbo. I din’t know he bowled even in the situations which you mentioned.That is really amazing! GREAT MAN JUMBO I love you!